(Courtesy photo | Cayanna Davis) Utah rancher Mark Nelson painted his thoughts about tourism on his cow, seen grazing along State Road 12 near Grand Staircase-Escalante National Monument. Like other residents of the scenic rural town of Boulder, Nelson is concerned with tourism’s rising influence on the community and surrounding landscape. Boulder rancher Mark Nelson has a beef with his town’s touristy direction, so he did what Americans typically do: He protested. But he did something else that Americans typically don’t do: He turned his own cows into message boards. Last week, as he prepared to turn eight head of cattle loose outside the scenic southern Utah hamlet he calls home, Nelson took some black paint and a brush and went to work, crafting a note for fellow residents of Garfield County. “COWS NOT CONDOS,” he splashed on the left side of one cow and the right side of another before putting them out on State Road 12. 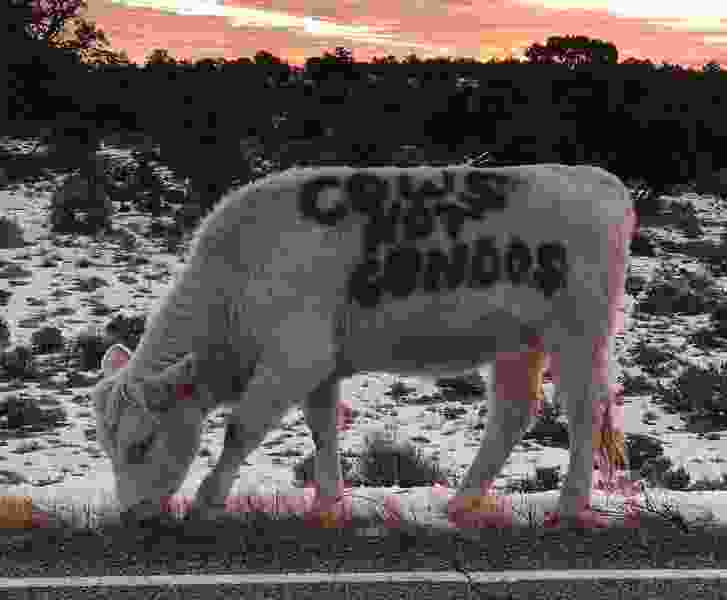 Among those who photographed the graffitied cows was Cayanna Davis, a Boulder high schooler who posted the image on social media, where it has bounced around cyberspace. But it’s Boulder’s future that prompted him to deface his own cows. Utah’s fights over national monuments have drawn global attention in remote towns like Boulder, located on the edge of the former Grand Staircase-Escalante National Monument, which President Donald Trump reduced by nearly half a year ago. “A 22-page article in The New Yorker is not a good thing for Boulder,” said Nelson, referring to a piece published in the Oct. 1 edition of the famous magazine detailing Boulder restaurateurs Blake Spalding and Jen Castle’s battle with the Trump administration. Nelson fears tourism’s growing imprint, exemplified by the chefs’ renowned Hell’s Backbone Grill & Farm, could dilute Garfield County’s rural way of life and alter the stunning canyon-cleaved landscape. Spalding is a leading voice in the fight, both legal and political, to restore the monument’s original boundaries. She argues her monument-dependent business helps preserve the town’s traditional character because it serves mostly locally grown food and provides living wages to many employees. Tourist visits were way up this year, which Spalding attributes to Utah’s campaign, endorsed by many ranchers like Nelson, to erase the monument. Another consequence, perhaps intended, would be the appearance of mines on nearby public lands stripped from the monument, she added, scaring away tourists and displacing ranchers. But Nelson wonders if Europeans swarming the Escalante canyons could be a worse threat than mineral prospectors. While they may disagree over the national monument’s reduction, probably every one of Boulder’s 240 or so residents wants to see the town’s quality of life remain intact. That’s true of Spalding as much as Nelson, 41 years after he moved there from the urban Wasatch Front.